It’s hard sometimes, and very easy to forget, to apply your sunblock…I know. At Glow Med Spa, we always hear “I wear it when I go to the beach” or “When I’m at the river.” But what about when you’re driving in your car? When you’re walking your dogs or shopping at one of Richmond’s awesome outdoor malls? Trust me…rain or shine, summer or winter, the sun will find you the moment you step outside! And why are we so worried about protecting our skin from the sunlight? Sunlight that penetrates the skin can create free radicals – highly reactive molecules that can weaken and destroy cell membranes. Free radicals can also damage DNA, create age spots and wrinkles and depress the immune system, increasing the risk of skin cancer. It’s a serious problem! But not to worry… Protecting your skin has just gotten a little easier. Did you know that the right combination of antioxidants can actually work like a sunscreen?! There is growing research showing that the correct formulation of topically applied antioxidants can not only turn back the clock, but also protect you from the sun! And to top that off, when you apply it, the antioxidants stay in the skin for 3 days…they won’t wash away! 5)Helps block UVA and UVB raysIn Asia, Ferulic Acid combined with vitamins C and E has been used as a sunscreen agent for years. Nobody in the states knew much about it until September 24, 2008, when Skin Inc. magazine wrote an article about the benefits of the C E Ferulic. They combined their findings with the test studies to show the effects of the antioxidants by applying the cream to nine adult Caucasians and then exposed them to simulated sun irradiation. The ferulic acid cream reduced skin redness after sun exposure and caused fewer skin cells to sunburn. It almost completely blocked the production of thymine dimers, what causes skin cancer, as well as the induction of the tumor suppressor gene p53. Now, we know that this super antioxidant can protect from the sun, but it is still very important to put your sunblock on. Think of it like this: It’s raining outside and you put your ‘C E Ferulic’ raincoat on…now you are semi pro, but zinc sunblock is basically your umbrella. Wear them both and protect that beautiful skin! 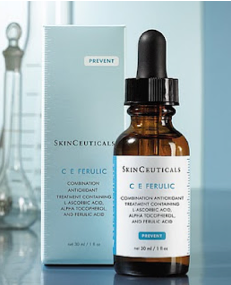 So, tell your friends and come grab some CE Ferulic acid at Glow Med Spa today. 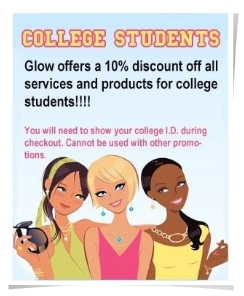 Oh, and of course ask your Glow Esthetician if it would be good for you!